Google is one of the world’s leading technology companies and specializes in Internet-related products and services, including the video-sharing website YouTube. It also makes tools, resources, and reports on market research and trends available through its website Think With Google. 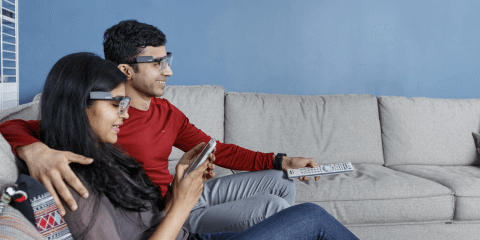 The company wanted to understand how people consume media on multiple screens in their daily lives, and partnered with Tobii Pro Insight to conduct a study in the participants’ own home environments. Wearable eye trackers were sent to the participants, who were able to record the entire process and collect behavioral data themselves, for a full week, without the presence of researchers. This ensured that the study did not infringe on the natural media engagement of the participants and that the insights gained were objective. Key findings from this study revealed which ads and media platforms were most effective in capturing and holding people’s attention. The findings also revealed important details about what people ignored, what distracted them, and what offline activities their attention was diverted to when they looked away from their screens. "Tobii Pro Insight carries out behavioral studies, in real-world environments such as in the home, for businesses without requiring any knowledge of this research methodology or extra resources from their company. In-home studies using eye tracking allow participants to behave naturally and data can easily be collected unmoderated and passively. This is then analyzed by our research team for valuable insights into what actually captures peoples’ attention." So how do you break through without breaking the bank? Tobii Pro Insight's comprehensive in-home eye tracking study "Earning Attention" outlines what elements of a TV-commercial catch and hold attention. The full complimentary report including key tactics is available for download here.